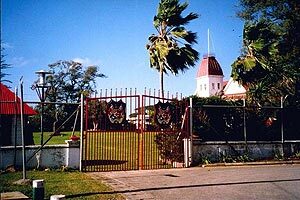 I was lucky to hear Tonga Broadcasting Commission in Finland on November 13th 1998. I wrote a more detailed report about the catch titled Nailing Tonga, but here is a short overview of the station. Initially I got no response from the station, but In March 1999 I sent a follow-up report and later an inquiry by telefax. This finally prompted Chief Engineer Sioeli Maka Tohi to send his kind confirmation letter by telefax. Later by mail I also received their traditional QSL card featuring call-letters A3Z. Sioeli Maka Tohi was able to confirm the report as all the details matched their program rundown. Later he also told me that they had recognized the announcers on the tape. Finally! The station had never before been heard in Europe on AM. For me Tonga became the 200th verified country according to the conservative count of the Finnish DX Association. A fitting reward indeed. Tonga is a parliamentary kingdom of 110 000 inhabitants scattered over dozens of islands totalling 750 square kilometers. The capital Nuku'alofa is located on the main island of Tongatapu. Like most smaller Pacific nations, Tonga is relatively poor - for example Finland's per capita GDP is eight times higher. A3Z Radio 1 on 1017 kHz, with a power of 10 kilowatts, is the only AM transmitter in the country. 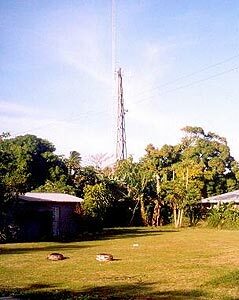 Both the public broadcaster Tonga Broadcasting Commission (TBC) - known as the Call of the Friendly Islands - and its private competitors have transmitters on FM. Until now only private companies have ventured into television, but TBC is planning to set up a TV station. Originally the deadline was November 1999, but it has been postponed, says Chief Engineer Maka Tohi. Until 1992 TBC used to operate also a 1-kilowatt shortwave transmitter, which was never heard in Finland. The transmitter has broken down, and there are no plans to fix in the near future, because AM easily covers the entire nation. TBC contact information listed in the World Radio TV Handbook is valid. In 2000 the station briefly had its own website, complete with samples of their station identifications and a chance to shop for TBC souvenirs, but unfortunately it has been gone since early 2001. Tonga Broadcasting Commission has a staff of 60 people to run two radio channels, both nearly 18 hours a day. Broadcasts are in Tongan and English, with relays from the BBC, Radio Australia and Radio New Zealand. Interestingly, the station is not financed by license fees or through the state budget, but by advertising revenue and profits from a retail radio shop, which is owned by the TBC! A3Z was established in 1960 to provide a link connecting the people of the different remote islands. Even after the arrival of telephone, linking the people is still a primary function. Broadcast time is given to various churches, community and civic organizations, as A3Z is the only station that covers the entire nation - and, as it seems, occasionally reaches much beyond!